Lime-a-lishish Pumpkins! Smiling and ghoolish pumpkins line this black satin ribbon. Underneath lays a satin ribbon that says "TRICK OR TREAT" and then an orange sheer satin ribbon with black fringe edges. There are 2 strips of orange with black dots and 2 strips of lime green with black dots that lay on top of the 1.5 inch lime green base bow. 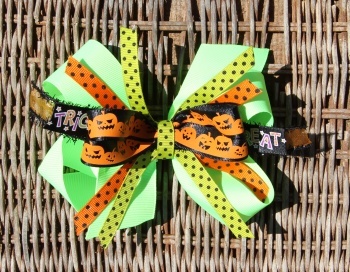 The center is wrapped with a lime green polka dot ribbon and is attached to a French clip. 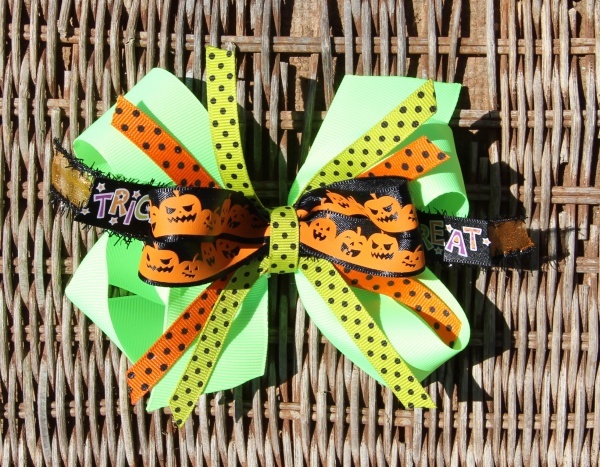 Get this great Halloween bow for all of your upcoming Halloween parties, pumpkin shine nights, and fun jumping parties to match her Halloween outfit!